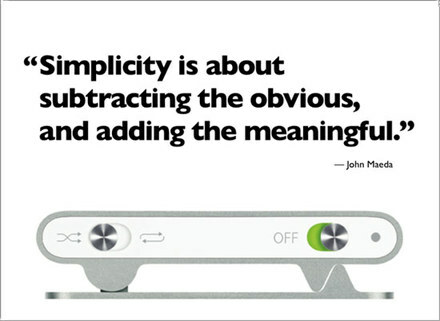 Presentations and the "Laws of Simplicity"
John Maeda's book, The Laws of Simplicity, is a good quick read. I love the clear presentation of the ideas in the book and the fact that the author imposed a limit of 100 pages for himself, an idea consistent with his Third Law: "Savings in time feels like simplicity." This book is not the final word on the topic of course, and in fact more is to come soon on the topic by MIT press. While the book is not perfect — the acronyms (SHE, SLIP, etc.) 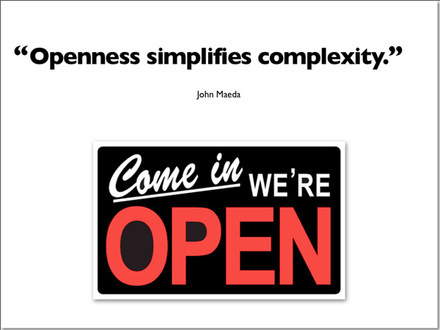 complicated things for me a bit — it is still better than most other books on simplicity aimed at business people. I must have three or four other thick business books on my shelf with the word "simplicity" in the title. Long winded, business books that espouse the need for simplicity today yet are filled with academic "blah, blah, blah" to get them to the obligatory length for a "serious business book." Maeda's book is different and it's fresh. 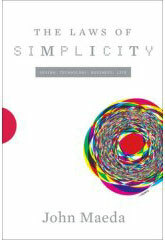 Much of the book's content can be found on Maeda's blog, The Laws of Simplicity. So if you want to save some money, it's basically all online. I think it was Seth Godin who said books are now a kind of "leave behind" for people once they have heard your story. People expect some sort of hard copy even if it is all online. If it is "your latest book" so much the better. There is just something about a book in the hand that is so much more "real" and "engaging" than the seemingly ephemeral text on a screen. My copy of Maeda's book (which I've read twice) is now rendered "very used" with folded page corners and pages filled with notes to myself, underlined passages, sketches, and even a coffee stain or two. (Yes, I know that this style of writing in books shocks some people, but at least it keeps them from borrowing my favorite books <g>). I'm buying several copies of The Laws of Simplicity and giving them to friends for Christmas. Its approachability and brevity make it a great gift for the busy entrepreneur. The champagne approach: "Become like bubbles in a glass of champagne, floating upward in unexpected, elegantly fluid ways." Maeda's "champagne approach" was inspired by the French rugby coach, Jean-Pierre Elissalde, who assessed that the Japanese national team (which he would coach), though technically solid, were too predictable. Their mechanical precision was too easy to anticipate and to stop. They needed to play on intuition and gut feel as much as calculated precision. Like the Japanese rugby team, we too need to become like bubbles in a glass of champagne, floating upward in unexpected, elegantly fluid ways. Learn to operate on intuition not just intellect. It is not just about mechanics and doing everything "technically correct." Doing it "by the book" or "by the numbers" is rarely a good approach in a live presentation, an activity which is very much a human one and requires a human touch. Below are Maeda's three keys that comprise the Tenth Law. Key 1: AWAY. 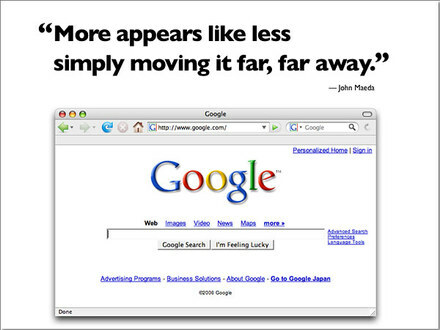 More appears like less simply moving it far, far away. Maeda refers to examples such as the simple Google homepage which of course sits atop a very complex network of computers and databases. For the end user Google is supremely simple, visually and otherwise. The result is local, Maeda says, and it's made simple by moving the actual work to a location far away. In the world of the 20-minute or even one-hour presentation, it is not possible to show or to talk about all of the background, all of the research, past failures, the reams of data, etc. that support your conclusion or have served as the antecedent to your current opinions about the issue you are today presenting. So, given time limits and the limits of the medium (an ephemeral live talk rather than material documentation in the form of a 400-page book), you state your case and give the appropriate evidence to support your story, but most of the background or details about that evidence are not introduced during your talk. This does not mean that those details are not important or that by removing it far away (figuratively) that you are embarking on a journey of superficiality. Many presenters fail because they did not first think hard about how and what to "remove far away." If you try to tell them everything, you tell them nothing. I am not suggesting you water down your story to talking points and the repetition of simple statements for a mass audience, a technique favored by politicians and ad agencies pushing bubble gum and potato chips. Instead, by moving important material far away, for the moment, you can make your message more powerful. In the context of presentations, moving info away can help you and the audience see the forest for the trees. "There are signs," says Maeda, "that a 'for free' open approach can lead to a 'for a fee' approach." If selling anything requires trust on the part of the buyer, it's odd that more organizations do not get that if you have an open approach and even "give it away" to some degree that this can lead to very good long-term benefits for both the organization and the customer. Maeda uses the example of the "Ruby on Rails" Web frame work by 37signals which is free but has related for-pay services. There is greater risk in an open approach -- whether we're talking about presentations or business in general -- but there is the possibility for greater reward as well. It's up to you. It's not easy and it has risks, risks too great for many perhaps. As Maeda points out, "I Love You" for example is perhaps the risky phrase of all, yet the rewards are immeasurable, are they not? An open approach to your presentations, or even to your approach to life in general, requires a belief in yourself (and your message, your mission, service, etc.) and the courage to muster up an equally risky phrase: "I Trust You." Here Maeda is talking about power, energy, battery life, etc. 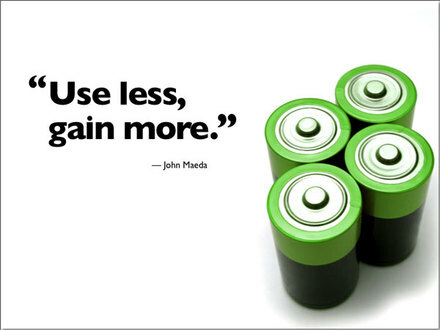 However, the application of "Use less, gain more" can go beyond energy. One could apply it to any resource including time. Time in fact may be our most precious resource of all, now more than ever. There are many ways to look at time. Usually we think about time in terms of "How can I save more time?" Sure time is a constraint for us, but when planning a presentation, what if we took the notion of "time saving" and looked at it from the point of view of our audience instead of our own personal desires to do things more quickly and save time? What if it wasn't just about "our time" but it was about "their time"? When I am in the audience, I appreciate it so much when I am in the presence of a speaker who is dynamic, has done his homework, has prepared compelling visuals which add rather than bore, and generally makes me happy I have attended. What I hate more than anything — and I know you do too — is the feeling I get when I realize I am at the beginning of a wasted hour ahead of me. But does your approach save time? OK, so sometimes the approach I advocate may use more time not less time for you to prepare, but the time you are saving for your audience can be huge. Again, the question is: Is it always about saving time for ourselves? Is it not important to save time for others? When I save time for myself I am pleased. But when I save time for others by not only not wasting their time but instead by sharing something important to them, I feel inspired, energized, and rewarded. I can save time on the front end, but I may waste more time for others on the back end. For example, if I give a completely worthless one-hour long death-by-PPT presentation 10 times to groups averaging 20 people, that equals 200 hours of wasted time. But if I instead put in the time, say, 25 hours or more of planning and designing the message, slides, etc. over a couple of weeks, then I can instead *give* the world 200 hours of a worthwhile, memorable experience. Software companies advertise time-saving features which may help us believe we have saved time to complete a task such as preparing a presentation, but if time is not "saved" for the audience — if the audience wastes their time because we didn't prepare well, design the visuals well, or perform well — then what does it matter that we saved one-hour in preparing our slides? One way I look at the spirit behind "Use less, gain more" is simply to "not waste," especially to not waste that which is not really mine to begin with such as other people's time. Preparing well can help make sure we do not waste the resource of other people's time. Another very simple way to "Use less, gain more" is to make certain our presentations or our pitches always end just a few minutes early. Note: My wife took this snap of me in a downtown Osaka Starbucks yesterday with her mobile phone (which, by the way, is so complicated I have no idea how to use). Maeda's book is not meant to be the last word of simplicity or even to provide many etched-in-stone answers. Perhaps the odd look on my face proves that the book asks more questions than it answers...but that is not a bad thing at all. Especially while kicking back for a few hours in a café. I rather like questions. dispelled now. What Richard does is a lot of work. The entire process of filming the lunch took about two hours, and while Richard and the CNN crew were very friendly and even funny, the filming was a very serious, focused affair. I have admired Richard's unique abilities as a TV presenter for years. In my book, he's one of the best. Richard's voice, style, and delivery does not appeal to everyone, but it appeals to me. Frankly, if no one hates your style (or your product, brand, company, etc.) then probably no one is a big fan either. There is a high price to pay for being average. In any event, I could not let this opportunity go by with out asking this world-famous presenter his tips on making a live business presentation or speech. So, during some of the breaks in filming I asked Richard what he would say to a group of business people hoping to improve their presentation skills. He was very keen to give me a thoughtful answer and went on in detail for quite some time in spite of the hectic schedule. Sure, nothing he said is necessarily new to you or me, but it means a lot to hear it coming from someone of his experience and talent. Below is a summary of some of the tips he shared with me in our conversation. • It's a performance. Like it or not, he said, if you are giving a speech or a presentation, you are performing. Of course, people like Richard are at an advantage compared to the rest of us, he admitted, since he does this for a living. Still, it is useful for all presenters to remember that they are, for that moment when they have the floor at least, performers. Richard was adamant, animated, and colorful about this tip. Forget the thank yous and small talk at the beginning, you can work that in later he said. At the start you immediately have to grab them and bring them in. Many people he said start their presentations off weakly, meekly. Open with a bang and remember to end your talk by tying the big finish back in with that dynamic opening. • Engage your audience. Ask questions, look them in the eye, get them involved. • Slow down, you are in control. This is your show, your stage. Use your voice to emphasize certain crucial points. Don't just rush through talking points, etc. • Pay close attention to your audience. Have some empathy for your audience. If they are not getting it or if it becomes clear that you have prepared too much or the wrong material, then switch gears, cut it short, whatever the situation calls for. Good presenters can read the nonverbal cues and act accordingly. • Tell stories, give plenty of examples. You don't have to make 14 points. Make a single big point. Most people try to include too much information not too little. Again, this is nothing you have not heard presentation experts recommend before. Still, it was good to hear it, not from a presentations coach or consultant, but simply from someone in the field who has made quite a name for himself in broadcasting based largely on solid speaking skills, among his other talents. And in case you were wondering, yes Richard really does talk like that even over lunch when the cameras are off, although his presence and intensity increase just a notch when the cameras are rolling. 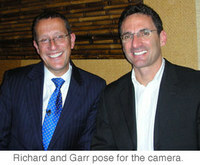 I think Richard is a great guy and certainly one of the most dynamic and popular anchors on CNN. I'm honored to have had the chance to spend some time with him while he was in Osaka. • You can watch a sample video segment from Richards show from the CNN Business Traveller website. Look under "On The Show" on the right side of the page. Over the weekend I read my review copy of Andy Sernovitz's Word of Mouth Marketing. I loved it. If you are an entrepreneur, business student, business leader, or involved with marketing on any level, this is a must read. This book is a good complement to other books I have read on the topic such as The Tipping Point and many of the books by Guy Kawasaki or Seth Godin, etc. Overall I think Andy Sernovitz does a very good job of nailing down this often-misunderstood idea of Word of Mouth Marketing (WOMM). There is nothing really new about the idea of WOMM, Sernovitz says, but what is different today is that because of easy-to-use internet tools WOMM is more plannable, actionable, and trackable. The internet has made things easier and made word of mouth more powerful, but as the author points out, most word of mouth still happens off-line. "Giving people a reason to talk about your stuff *and* making it easier for that conversation to take place." In other words, Says Sernovitz, WOMM is "...everything you do to get people talking." WOMM is about joining the conversation and participating *with* the market (your customers, community, groupies, etc.) not just talking *at* them. If Word of Mouth Marketing is about participation and conversations, then, obviously there is a potential for presentations of all types to play a large part in that mix. Of course, you have your sales presentations, your executive speeches, trade show demos, etc. Those are important. But there are many other ways presentations can be used to promote your brand, even if you're a one-man/-woman firm and that brand is YOU (in fact, WOMM is especially important if you're on your own). So besides the usual sales presentation route, look for opportunities to make presentations and speeches in your local community, at schools, universities, conferences, etc. about something you have expert knowledge in. Look for opportunities to "give it away" freely without expectations for anything in return except the good feeling that you get from teaching or sharing something you believe in or care about. If you make a presentation worth talking about, even if it was not specifically about your product or company, this reflects well on your organization and your brand. In fact, because you volunteer your time to "give it away" and share your time without a sales pitch, your audience may find your time with them even more memorable and worthy of discussion. Get them talking or get them signing on the dotted line? When you volunteer to present and teach, share, inspire, etc. with no motive except to be in that moment and do your honest, transparent best for the benefit of that particular audience, the result is often actually more "sales" for your "stuff" in the long run. The traditional way of thinking of marketing and your customers is to "get them to sign on the line which is dotted!" But in many cases — especially when we're talking about WOMM — it is not always about getting people to sign on the dotted line. Here's an example of doing it wrong. A few years ago I attended a computer user group meeting in Osaka. The group agreed to give representatives from a large wholesaler a chance to talk up their grand opening at the end of the meeting. They were given 15 minutes. When they took the stage they said they brought membership registration forms and were hoping to get a lot of user group members to signup on the spot. They made this request about one minute into their presentation. When the audience showed no interest in signing up on the spot (one can always signup at the store in future) the presentation stalled. Their approach was awkward and ill-prepared. They clearly thought they could just show up and let the famous wholesaler name speak for itself. It was clear that they were there to get bodies to sign on the dotted line. But there was no passion in their voice and they could not explain what made the store so cool. What's worse is that they were visibly disappointed that no one signed up. Because their only measure of success was "to get people to sign on the spot" rather than to tell their story and get the conversation going, to make connections, and participate in that conversation, they wasted a great opportunity. Their presentation should have been the start of the conversation and the start of a relationship, but they looked at the talk as a chance to pitch, sign, and bring the conversation to a close...and move on to the next target. Here's an example of doing it right. Last year a buddy of mine, a successful entrepreneur in Japan, gave a free presentation for my design group about what it was like to design and open a new high-end café in the city. It was quite an interesting ordeal with valuable business and design lessons for the audience. He prepared a highly visual, well-planned presentation that was entertaining and educational. At the end of his talk he also gave out nicely wrapped samples of his teas and sweets to every member of the audience. Although he surely made some new customers that night, he never tried to sell or talk up his cafes. He told his story and made a connection, but he was not making a pitch. There is a time for pitching, of course, but when you're presenting in the spirit of sharing and "giving it away" anything resembling an infomercial undermines credibility. In this case the presenter's credibility went up...and so did the buzz surrounding his product. A point Sernovitz makes in the book is that we must make it easy for people to talk about us (i.e., our firm, our brand,, etc.). For example, Apple gives registered Apple User Group leaders access to many free tools such as downloadable Keynote presentations that they can use to give live talks in their communities (though Apple does not do nearly as well as they could with the user groups these days, but that's another story for another day). What makes groups like Apple user groups so special is that their word is more credible than the company's largely because they do not profit personably from endorsing the products they so enthusiastically use. "Happy customers are your best advertising. Make people happy," says Sernovitz. The idea of "giving it away" or "pooping" (a term borrowed from Guy Kawasaki) is a key philosophy to embrace in an era when customers do not believe advertising and do not want to be sold to. Customers, as Sernovitz says, prefer to listen to and get their advice from "people like me." There are many ways for companies, organizations, and entrepreneurs to get closer to their markets and engage with them in a real, honest, genuine human voice. Taking advantage of speaking opportunities and volunteering to "get out there" (where it's risky) and make presentations and have conversations is just one very small part of Word of Mouth Marketing. 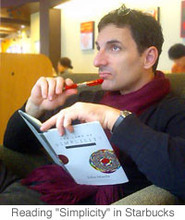 At the beginning of chapter three Sernovitz lists twelve points in his WOMM Manifesto. These four below are good to keep in mind when you're mulling over the idea of going "out there" to present naked in your community. • Negative word of mouth is an opportunity. Listen and learn. • People are already talking. Your only option is to join the conversation. • Be interesting or be invisible. • If it's not worth talking about, it's not worth doing. Onomatopoeia is not a word you use everyday, yet hardly a day goes by that we don't use several onomatopoeic words and phrases in daily conversation. Onomatopoeia refers to words that imitate the sound they represent such as "kerplunk" or "boing" in English or "doki doki" in Japanese. We might not hear onomatopoeic words used in formal written speeches so often, but we certainly hear them used in everyday conversation. I am not a linguist (so please chime in if you are one; love to hear from you) but perhaps this is one reason why informal "naked presentations" or good impromptu or extemporaneous speeches are often more interesting or engaging than speeches which are merely read word for word from a script. In the U.S., celebrity chef Emeril Lagasse is famous for punctuating his presentations — in his case entertaining cooking demos — with the onomatopoeic phrase "Bam!". 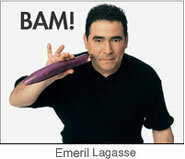 Emeril's use of "Bam!" is well documented and has become a signature of sorts for him. I do not have a video of him actually using "Bam!" but this promo video for his show gives you an idea of his presentation style on the show. Of course, this guy was know for this onomatopoeic phrase long before Emeril. I knew of Emeril's "Bam!" 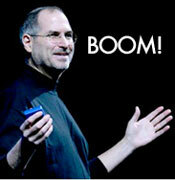 but was unaware of Steve Jobs' "Boom!" I had never noticed that Jobs peppered his speech with "Boom!" in his demos, though I certainly have noted here many times that his tone is almost always informal and conversational. Jobs is using the onomatopoeic word, probably unconsciously, to emphasize the quickness of a process or the ease of a task: "Step one, step two, and Boom! — There it is!" At other times Jobs seems to use "Boom!" as a kind of "voilà!" or "presto!" or "ta-da!"